DEATHRASH was formed in 1985 by Pat Burns (bass), Marc Grossman (drums), Pat "Nemo" Nemeth (guitar) and John Scherer (vocals). Marc Grossman left the band in 1986 to pursue other interests. 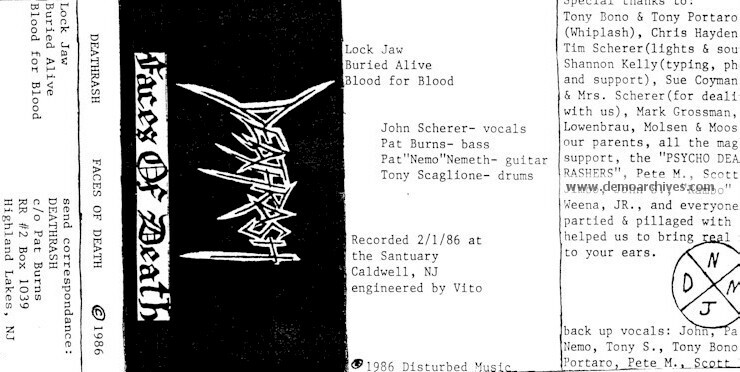 With the help of drummer Tony Scaglione (WHIPLASH, SLAYER) we recorded our "Faces Of Death" demo which received worldwide acclaim through fanzines and college radio. 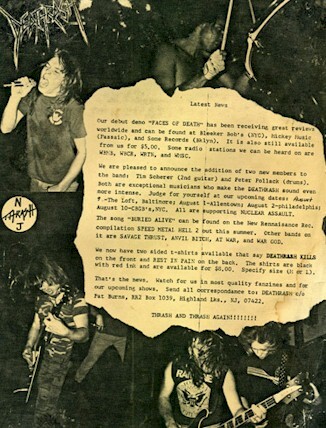 The song "Buried Alive" from the "Faces Of Death" demo was signed by New Renaissance Records to be on the compilation album "Speed Metal Hell 2". Tim Scherer joined the band in 1986 on guitar and made the DEATHRASH sound even more intense. In 1987, on the verge of recording our second demo "No One Is Innocent" and with contracts in negotiation the group disbanded. 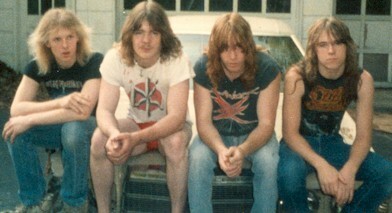 In 2005 the band reunited with all the original members and are in the process of recording "THRASH BEYOND DEATH".